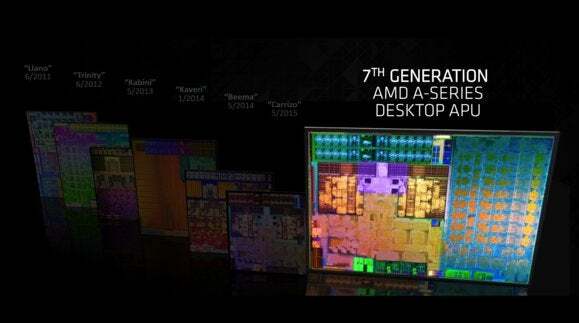 AMD on Monday said PC OEMs are set to soon ship desktop PCs using its faster Bristol Ridge chip. HP and Lenovo will be among the first to offer desktops using the new Bristol Ridge APU that offers higher computing and graphics performance than previous models. Bristol Ridge, the company said, easily outperforms its Intel equivalent by up to 100 percent in game performance. AMD said compared to its own previous gen Carrizo APU, compute is increased by 17 percent and graphics is up 27 percent. AMD has long had a graphics advantage over comparably priced Intel CPUs and Bristol Ridge looks to stick with that philosophy. The x86 likely isn’t going to change too much though. AMD showed of PCMark 8 performance numbers the test it chooses stresses OpenCL performance, which gets an uplift from graphics. 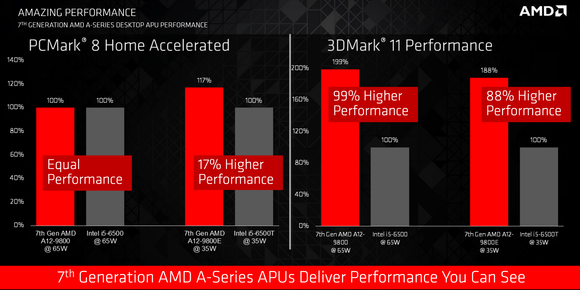 AMD said its new Bristol Ridge APU outperforms Intel’s Skylake chips in graphics by up to 100 percent. With Intel’s new Kaby Lake chip featuring advanced CODEC video support as a prominent feature, AMD said Bristol Ridge will also support VP9 and H.265/HEVC video in hardware. AMD’s new Bristol Ridge improves overall compute and graphics performance the company said. For all its chest thumping, AMD’s Bristol Ridge isn’t the chip many are anticipating. Bristol Ridge continues to be based on the company’s older microarchitecture and is built on an older 28nm manufacturing process too. 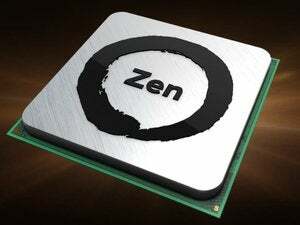 The main fight is will be centered around AMD’s Zen-based Summit Ridge due out in systems late this year. AMD has claimed it will put it back on par with Intel’s best. Despite using its older microarchitecture, Bristol Ridge does feature one next-generation buliding block: Its AM4 socket. AM4 brings reunification to AMD’s products by working with Bristol Ridge and Summit Ridge. This should greatly simplify AMD’s lineup and technically could offer better upgrade paths for consumers. AMD said Bristol Ridge will ship the AM4-based B350 chipset for mainstream consumers and the AM-based A320 for “essential” consumers. For those into tiny machines, AMD said a new X300, B300, and A300 chipset will fulfill those roles. AMD’s new AM4 socket and chipset will support its 7th-gen APU as well as the upcoming Zen-based Summit Ridge CPU. As the company describes the Bristol Ridge and Summit Ridge chips are System On Chips, they contain up to a x8 PCIe gen 3 for external graphics, dual-channel DDR4 support, four USB 3.1 5Gbps ports, and two SATA ports, plus an additional two lanes of PCIe for storage. The B350 chipset adds additional USB ports including USB 3.1 10Gbps, a few more PCIe lanes, and more SATA ports that support various RAID configurations. AMD details its consumer and mainstream AM4 chipsets but its enthusiast chipset is still shrouded in mystery. The layout of Bristol Ridge with its AM4 chipsets gives us a possible glimpse of why AMD considers the new chips, including the Zen-based Summit Ridge “SoCs.” Although there is no hard line on what defines an SoC, they typically contain enough functionality that they can mostly operate independently beyond adding RAM or storage. If the Zen-based Summit Ridge follows the same path as Bristol Ridge, it looks like AMD may integrate memory controller, PCIe, USB, and SATA into it. But as it has done with Bristol Ridge, Summit Ridge probably will get far beefier SATA, PCIe support from the chipset to address enthusiast’s needs. Why this matters: In the larger scheme of things, Bristol Ridge is another evolutionary step forward for AMD that likely isn’t going to be a game changer. 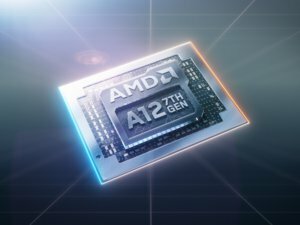 Far more significant is the introduction of the AM4 socket and chipsets which will eventually run the highly anticipated Zen-based replacement for Bristol Ridge.